Watch Your Heads, Guys! | So Many Exciting and Beautiful Places! We heard that several times during today’s excursion. Amazingly, we had another mostly sunny day, but rain would not have deterred us. The motto of today’s tour company, Canal Fun & Nature Excursions is “Never judge a day by the weather.” Excellent advice in a region that has sunny days only 35 – 40 days per year. On our way to our destination, we stopped for a few photo opportunities, including one at Carbajal Valley, a large glacial valley where peat is harvested for fertilizer. This peat is wet, being almost 70% water, which is safe to drink if you need it. The peat moss here grows at a rate of only about 1 millimeter per year. In some places, it is 10 meters thick, so it has been growing there for 10,000 years. 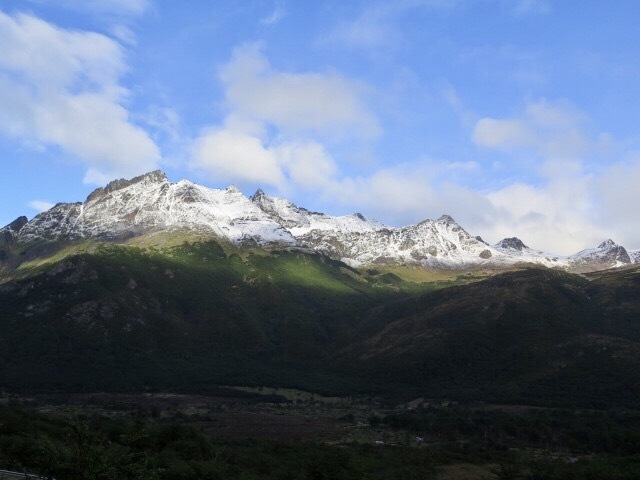 The Carbajal Valley is surrounded by mountains at the southern end of the Andes. These mountains are not very high – the highest one, Mount Olivia, is about 4,350 feet high. It’s still impressive, though, with its sharp peak. We then hiked along an old woodcutter’s trail into the Fuegian forest. Here again, there are the three types of native trees, one evergreen and two deciduous. They are all related. 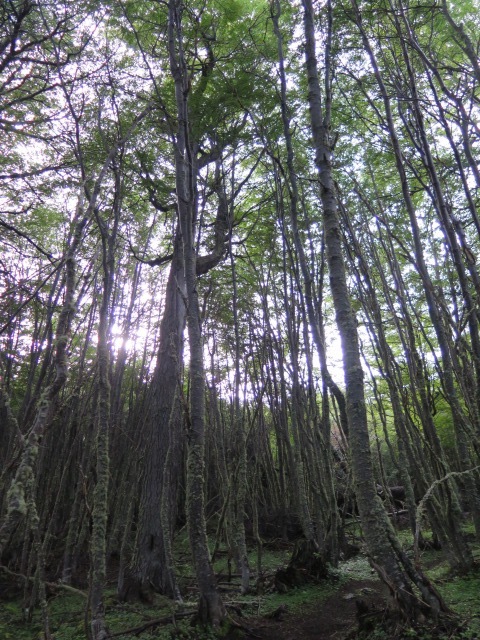 Of the two deciduous, the lenga beech is used for furniture and construction as it grows quite tall and straight. The other deciduous is a low growing version. We saw quite a few downed trees. Geographically, this is fairly new land and the soil is not very deep. 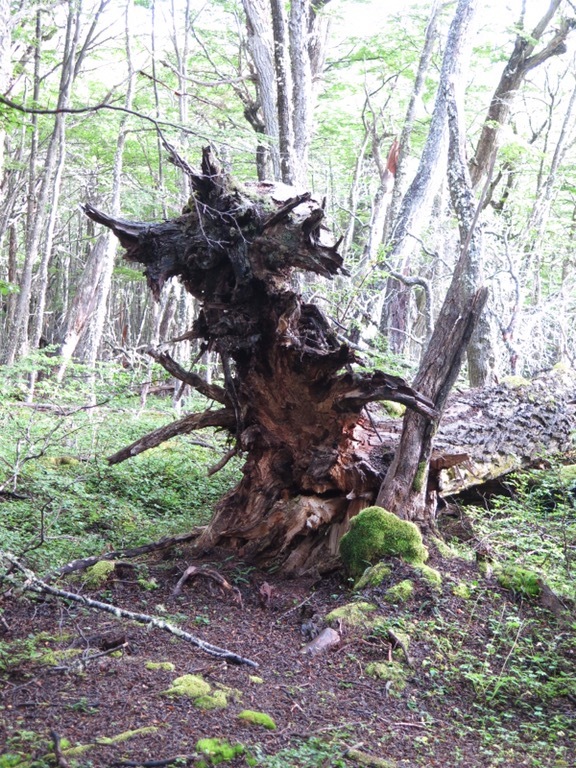 A shallow root system makes these trees vulnerable to the strong winds that blow through Tierra del Fuego. The trees can take up to 1,000 years to decompose because the climate is often not warm enough to foster the bacteria that cause decay. For that reason, trees that look like fresh fall may actually be decades old. 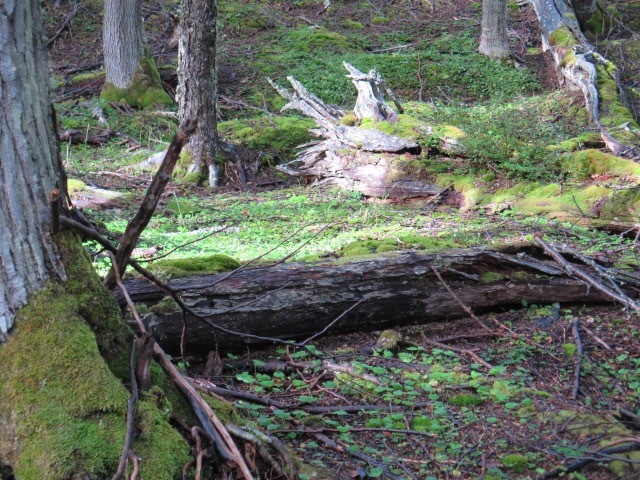 Many are covered with beautiful green moss. 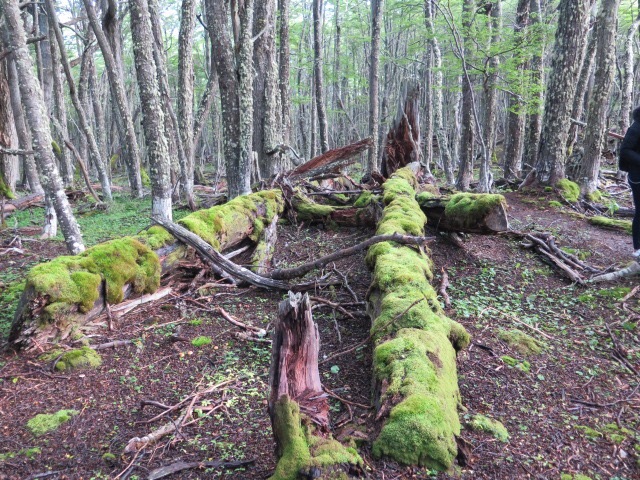 When they do begin to decay, they can act as nursery logs for new trees and plants. The trees are slow growing. We saw several examples of damage by beavers who were introduced here in the 1940’s to try to develop a fur trade. Only 20 were originally brought here, but, with no natural predators, they now number about 100,000. The fur was not marketable – it takes a colder climate for the beaver’s fur to become long and thinks. 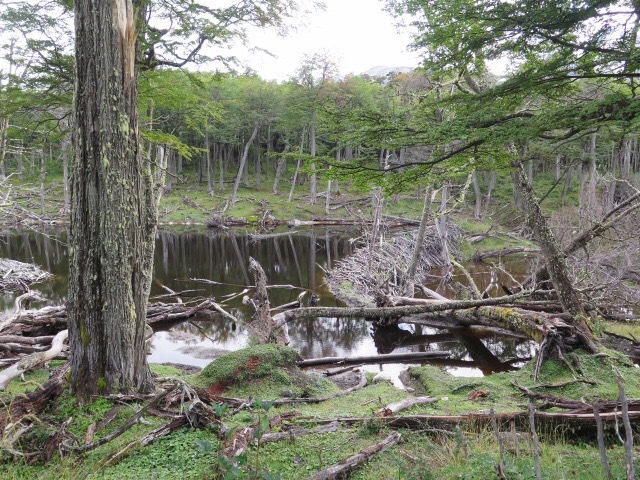 These beavers are destroying the Fuegian forests, which cannot regrow quickly enough to replace what the beavers take down. 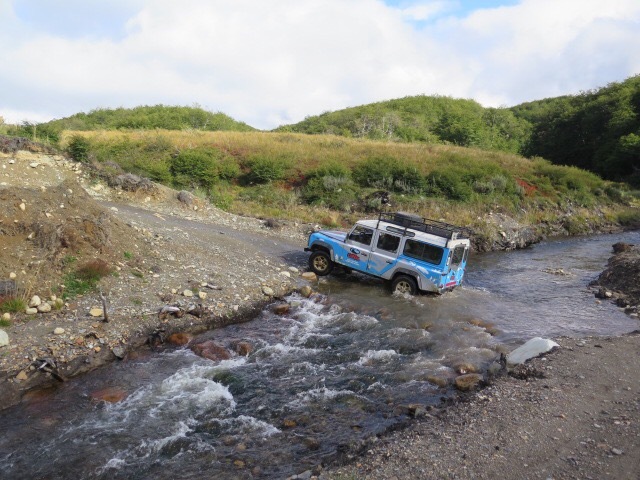 After our hike, we boarded a Land Rover for an exciting ride on muddy roads and across flowing streams. This is when we heard the admonition to watch our heads – several times. We stopped at one point to see a large beaver dam and several beaver huts, surrounded by dead fall. 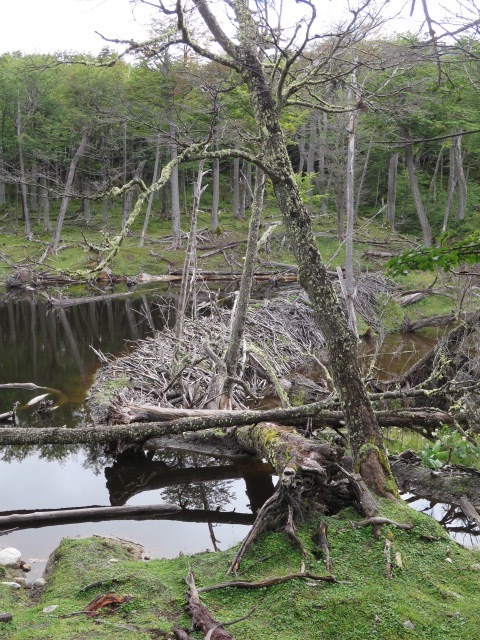 Each year’s new beaver crop build their own huts and so the devastation continues. Lunch was served at Llanos del Castor Restaurant. Besides a meal, the tourist can play mini-golf (I saw two holes,) rent snowmobiles in the winter, or take a sled dog ride. 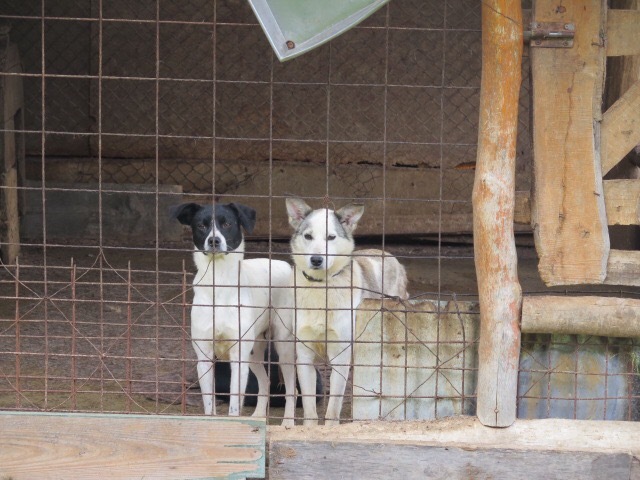 They had several sled dogs there, including Alaskan Huskies and Greysters, a mix of Alaskan Husky, German Shorthaired Pointer and Greyhound. 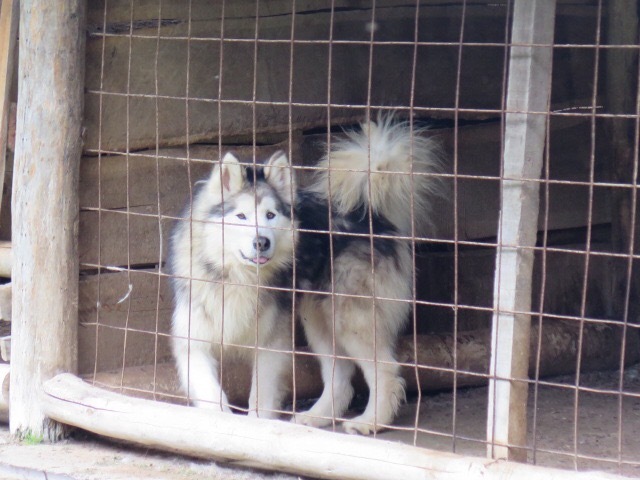 They have great endurance and can run even faster than the Alaskan Husky. Back to town and the ship, where I PANICKED!! My camera was missing! You almost didn’t get to see my photos today, and I know how disappointed you would have been. Fortunately, the ship was able to contact the tour guide who found my camera in the vehicle and returned it. Yay!! I do back up all of my shots each day, but would have lost those from today, and would have had to borrow Mark’s camera for the rest of the trip. Or, buy a new camera. On board, we enjoyed a presentation by Ice Captain Keith Johnson who served many years on ice breakers for the US Coast Guard. He was appointed Commanding Officer of the USCGC Polar Sea in July, 2000, on board which he participated in six Operation Deep Freeze deployments to Antarctica and five extended Arctic scientific expeditions, being at sea for up to six months at a time. As Ice Captain aboard our ship, he will advise the Captain on navigation and meteorological matters while in the Antarctic waters. Captain Johnson showed a video from the Polar Sea, showing life on board the ship as well as the ice breaking activities. This ship has 3 turbines and 6 diesels, generating 45,000 hp. It could cut through 21 feet of ice as it cut its way to McMurdo Staton, a US Antarctic research center on the south tip of Ross Island. Polar Sea held two helicopters, and carried up to 35 scientist. It has been out of service since 2010. 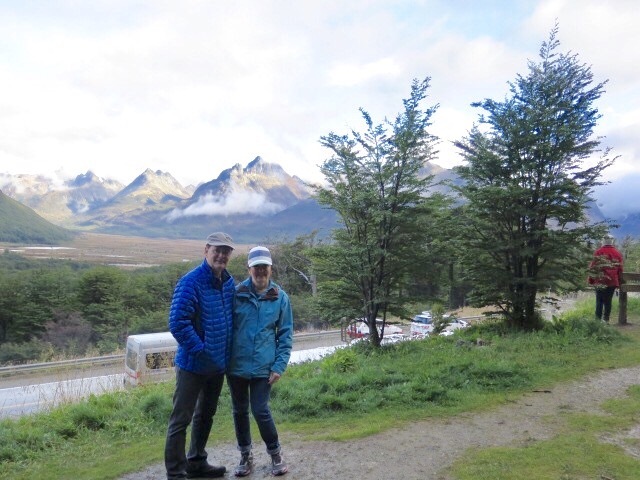 We left Ushuaia around 6 pm, and are headed to Cape Horn, the most southerly part of South America, and the northern boundary of the Drake Passage. The Atlantic and Pacific Oceans meet just south of Cape Horn. 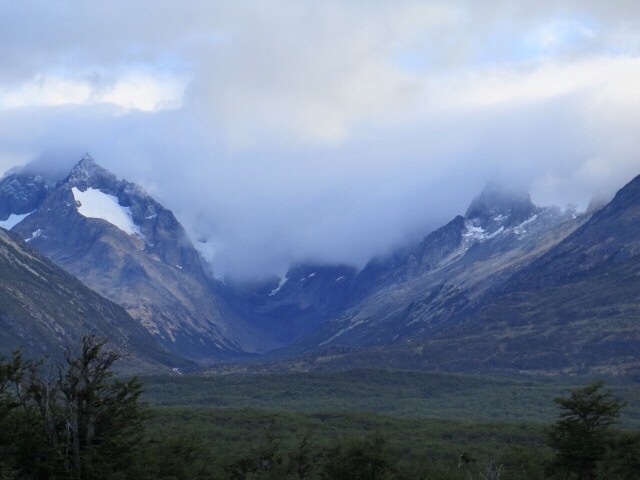 This entry was posted in Antarctica, Argentina, South America Travel, Uncategorized and tagged Tierra del Fuego, Ushuaia. Bookmark the permalink.